Symptom: Identity Panel Web is missing several tabs from the web interface; Dashboard, History, Reports & Settings. Reason: A default IE security setting that allows Custom fonts to be downloaded has been disabled by an administrative policy. 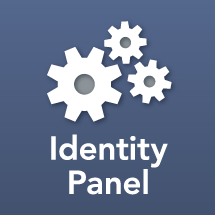 Resolution: Add the Identity Panel Website to a security zone that allows fonts to be downloaded or allow fonts to be downloaded in the current security settings.